I have made no secret of my passion for the music which has been coming out of the Scandinavian portion of our planet. My knowledge of these musical traditions is mostly limited to the twentieth century up to the present but what a horn of plenty there is to be had. There are so many composers that it is forgivable if one of them fails to get worldwide attention and acclaim during their lifetime. Or is it? Well if sins of omission that have been committed all can now be forgiven and the memory of Axel Borup-Jørgenson (1924-2012) is likely guaranteed to remain solidly in the history of music of the twentieth century. The Danes take their music very seriously it seems (check out the You Tube Channel for the Danish National Symphony Orchestra if you don’t believe me) and producer Lars Hannibal and his crew have labored tirelessly to bring this formerly obscure master most deservingly to light in this DVD/CD combo pack featuring some of his finest works. This truly major release contains a DVD with a gorgeous animated feature synced to the late composer’s swan song big orchestral piece, Marin op. 60 (1963-70) a really beautifully produced documentary (“Axel”) on the composer featuring some of his fellow composers including, Finn Savery, Pelle Gudmunsen-Holmgreen, Bent Sørensen, Sunleif Rasmussen, Per Nørgard, Gert Mortensen, Ib Nørholm, Michala Petri, and producer Lars Hannibal along with family and other musicians and producers. The animated feature looks like one of the finer entries one might find on Vimeo. The animation was done by Lùckow Film and works well with the music. The biographical feature does a spectacular job of placing the composer in context with his Nordic contemporaries and with contemporary music in general. The people interviewed give about as definitive a description of the man’s work as can be done in a film biography and the intervening or connecting scenes bespeak a high level concept of cinematography that makes this film both compelling and a delight for the eyes as well as the mind. The concept of the composer’s use of silence as a compositional tool seems to be reflected in these transitional scenes. The CD consists of seven carefully selected pieces on seven tracks. The disc opens with the big orchestra piece which was heard behind the animation on the DVD, Marin Op. 60 (1963-70) followed by Music for Percussion and Viola Op. 18 (1955-56), For Cembalo and Orgel Op. 133 (1989), Nachtstuck Op. 181 (1987) (played here by the composer’s daughter, Elisabeth Selin), Winter Pieces Op. 30b (1959) for piano, Pergolato Op. 182 (2011) for treble recorder, and Coast of Sirens Op. 100 (1980-85) for flute, clarinet, violin, cello, guitar, piano, percussion, and multivoice tape. This is truly a balanced portrait with examples of orchestral, solo instrument, keyboard, chamber and electroacoustic works from 1959-2011, a more than fair sampling of the composer’s output both by genre and by time. The music seems to move between post-romantic tonality and expressionistic experiments such as one hears in the music of Gyorgy Ligeti. The music is evocative and very listenable especially if one avails one’s self of the introductory film. It certainly seemed to tune this reviewer’s ears properly. It is helped as well by some very fine recordings that capture the subtlety of the composer’s work. Lars Hannibal is clearly the guiding hand in this project but his genius (he is a fine guitarist as well as a producer) is his ability to engage all these fine musicians, artists, producers, and family in what is one of the most loving portraits this writer has ever seen. Now that is the way to blast someone out of obscurity forever. And this is but one entry in a larger project to record the composer’s complete output. Two previous releases were reviewed on this blog and, presumably there are more to come. But in the meantime there is much to savor here and one hopes that this will introduce this music into the general repertoire. I’m sure Axel would be pleased to be placed as he is now among the masters of Danish composers. I recall excitedly taking a class in college in the late 70s which dealt with post 1950 composition. The professor emphasized that the reigning characteristic of this music is “pluralism”, that is to say that anything goes and one gets less useful information from labels like, “classical”, “baroque”, “romantic”, “post-romantic”, “post-modern”, etc. There is no question that this maxim remains very true and we now are seeing composers well-versed in virtually every technique known to the world of composition. This album is a fine example of such pluralism. Seeing names such as Elliott Sharp and Gareth Davis one might expect something of the “free jazz” genre and that would not necessarily be an inaccurate description. But it would fail to capture the wonderful writing for Ensemble Resonanz by the eclectic (yes, pluralistic too) Elliott Sharp. As a composer Sharp draws on late twentieth century modern/post-modern compositional techniques along with a fair amount of his own creative innovations gleaned from his own experimentation and, no doubt, from his exposure to the wildly creative milieu of the Downtown New York scene of the 80s and 90s. The result is like listening to shades of Penderecki and Xenakis as they wrote in the late 1950s though the 70s. This is far more homage than derivation however and the achievement here is how well the soloists on guitar and bass clarinet fit into the work as a whole. They fit remarkably well. This could easily be called “Symphony for Ensemble with Obligatto Guitar and Bass Clarinet” or even Concerto if you like. The point is that Sharp is an engaging composer whose works are very substantial. From his beginnings on the New York Downtown scene with its mix of jazz, experimental and classical he has continued to explore and grow as a composer and that is what ultimately makes this release so compelling. The musicianship here from Ensemble Resonanz, Sharp and Davis is of the first order and there is a certain sense of a tight fit such that, whatever may be improvised here sounds as though it were carefully written into this large orchestral fabric. This is a powerful piece of music and repeated listenings will doubtless reveal more and more depth. This is a very engaging piece. Sharp is clearly evolving and growing as a composer and still hasn’t lost his marvelous collaborative and improvisatorial abilities. This is a major work and a lovely recording. Since her debut in 1969 at the tender age of 11 Danish born recorder virtuoso Michala Petri has been one of the finest masters of the recorder. This ancient instrument, a forerunner of the flute, has existed since the Middle Ages and has amassed a huge repertoire and Petri seems to have demonstrated mastery over all of it and has been an advocate and promoter of new music for her instrument as well. She has inspired composers to write new works for her and she continues to entertain audiences and has assembled an ever growing discography of startling range and diversity. Nearly single handed she has managed to honor past repertoire and firmly ensconce this instrument in the 21st century. 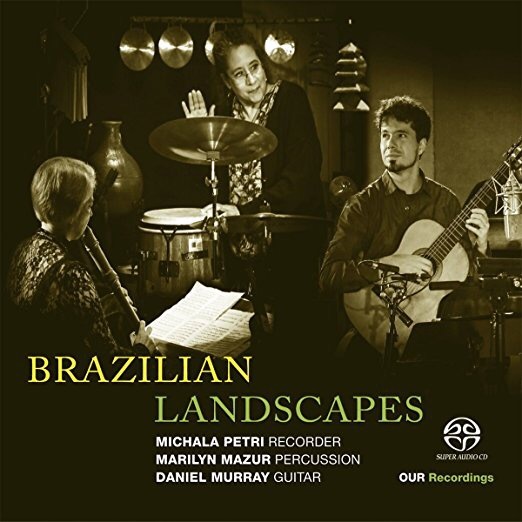 In this release, produced by Lars Hannibal (himself a fine guitarist and frequent Petri collaborator) Petri takes on the music of Brazil and, despite the fact that recorders have seldom found their way into the music of this geographic region, she delivers a convincing and hugely entertaining program on this disc. Along with Marilyn Mazur on percussion and Daniel Murray on guitar the listener is given an entertaining cross section of Brazilian music ranging from the more classically oriented work of Heitor Villa-Lobos (1887-1959) and Ernesto Nazareth (1863-1934) to the smooth jazz/pop sounds of Antonio Carlos Jobim (1925-1994) and Egberto Gismonti (1947- ). In between are included works by the album’s guitarist Daniel Murray (1981- ) and a few names unfamiliar to this reviewer including Paulo Porto Alegre (1953- ), Paulo Bellinati (1950- ), Hermeto Pascoal (1936- ), and Antonio Ribero (1971- ). ﻿There is a remarkable unity in this Danish production which stems from a meeting between producer Lars Hannibal and Daniel Murray in Vienna in 2014. Hannibal’s ear found a kindred spirit whose musicality is a good match for that of Petri. And like a good chef he added the delicate and necessary spice of the tastefully understated (but extraordinary) percussionist Marilyn Mazur to create a unique trio that sounds as though they’ve played together for years. Here’s hoping that they’ve secretly recorded enough material for a second album. All the tracks appear to be transcriptions though the transcriber is not named (I’m guessing they’re collaborative). What’s nice is that there is nothing artificial or uncomfortable about these arrangements. The overall impression left is that of a skilled ensemble and listeners encountering the original forms of these works might well assume those to be the transcriptions. So convincing are these performances. Let me start by saying that the only thing wrong with this album is that it is only one CD. Alberto Ginastera (1916-1983) is without doubt one of the finest composers of the twentieth century. Stylistically he holds much in common with composers like his contemporaries Aaron Copland (with whom he studied), Carlos Chavez, Leonard Bernstein and others who incorporated the spirit if not always the literal music of his homeland’s folk culture into his music. In additional to these nationalist works he wrote a substantial amount of traditional concert music which touched on the edges of modernistic trends. He wrote three operas, two ballets. two piano concertos, two cello concertos, a harp concerto, three string quartets, a bevy of piano music and sundry other items. It is simply not possible to contain a fair representation of his work on a single CD. Despite that this disc is not a bad retrospective. It is lovingly played and recorded and if it does not represent the whole of Ginastera’s oeuvre it is a nice sampling. The disc begins with the wonderful Harp Concerto Op. 25 (1956, rev. 1968). Though originally commissioned by Edna Phillips (principal harp of the Philadelphia Orchestra) she had retired before she could perform it and it was premiered in 1965 by the amazing Spanish harpist Nicanor Zabaleta. This three movement work is certainly one of the composer’s finest works and is beautifully played by Yolanda Kondonassis with the Oberlin Orchestra under Raphael Jiménez. This piece is one of the finest modern harp concertos and is representative of the composer’s international style with perhaps just a taste of modernism. Next up is the single movement Pampeana Op. 16 (1947) with the great Gil Shaham on violin and his sister Orli Shaham on piano. This is a sort of window on Ginastera’s earliest nationalist style full of melody and virtuosity. The next work is the Sonata for Guitar Op. 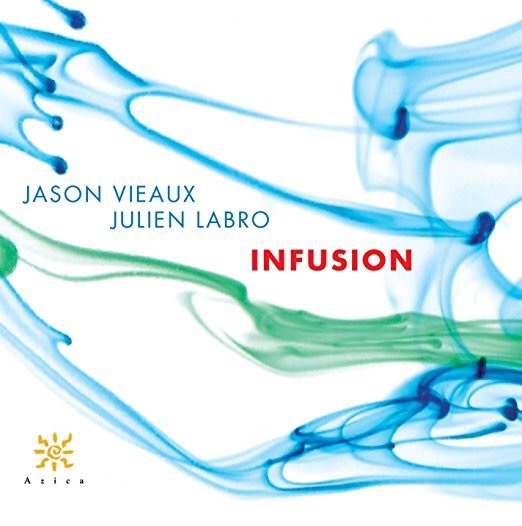 47 (1976) played by Grammy winning virtuoso Jason Vieaux. I had not heard this work and my first hearing was indeed a revelation. This is a major work for guitar and a wonderful sonata in the classical form. I gave these four tracks a few listens in an attempt to digest some of their beauty and complexity and I will doubtless give them many more listens. This is a major piece that belongs in the repertory. And, finally, we move to the earliest utterance here with the Danzas Argentinas Op. 2 (1937) in an exciting and dedicated performance from Orli Shaham. The sound is wonderful and there are a geekily satisfying set of liner notes which include a useful analysis by James O’Leary, Frederick B. Selch Assistant Professor of Musicology, Oberlin Conservatory of Music. All in all a beautiful production and a great introduction to Ginastera’s work but please, don’t stop here. Make sure you get to hear his other work and perhaps the wonderful folks at Oberlin will consider a volume two?